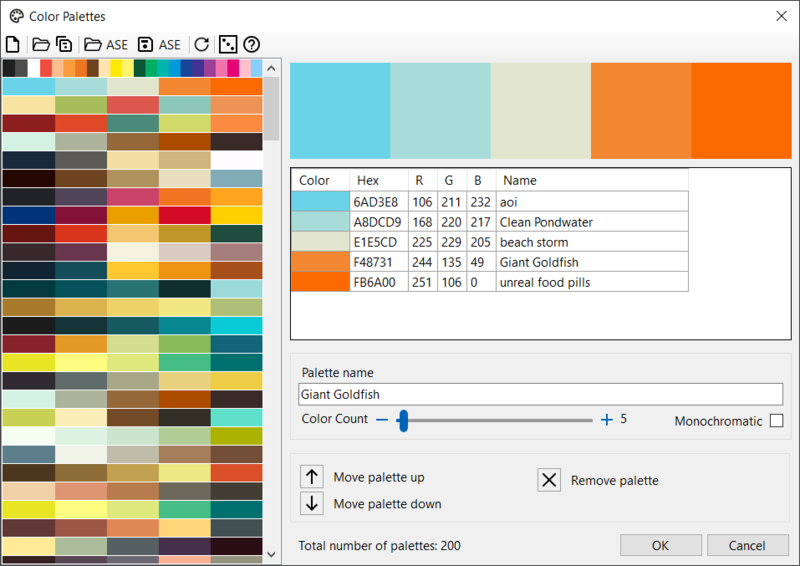 The Color Palettes command allows you to organize your color palettes. A color palette, is a set of specific colors used in a design project. The image shows the selected color palette and a table containing the details for each color. The table allows you to change the individual colors and color names. Click a color field to change a color. Click a name field to change a color name. The Palette name text field allows you to enter a name for the color palette. Drag the slider to change the color count. Every new color in the palette is by default white. Check 'Monochromatic' to create a monochromatic color palette. Every color in a monochromatic color palette is a shade of the base color. The New Color Palette command allows you to create a new color palette. The Open Color Palettes as XML file command allows you to open previously saved color palettes as XML file. The Save all Color Palettes as XML file command allows you to save all color palettes as XML file. The Open Adobe Swatch Exchange (ASE) file command allows you to open an Adobe Swatch Exchange (ASE) file. The Save as Adobe Swatch Exchange (ASE) file command allows you to save the color palette as an Adobe Swatch Exchange (ASE) file. The Reload Color Palettes command allows you to reload the default color palettes. The Random Color Palette command allows you to create a random color palette. The Move palette up command allows you to move a palette up the list. The Move palette down command allows you to move a palette down the list. The Remove palette command allows you to remove a color palette.